The fifth and final volume of Panchatantra. Therev were four Brahmins who lived in a city, which was suffering from utter poverty. There were four friends in a city, three of whom were learned in all departments of sciences but lacked common sense. The fourth of the friends names Subuddhi however had ample of common sense but lacked knowledge in scriptures. One day, they decided that all their learnings were of no use, if it is not used to earn money. They then decided to seek the patronage of kings with the display of their knowledge. There were four young Brahmins, who were good friends and always eager to acquire knowledge. They joined a monastery in a place called Kanyakubj to study sciences and scriptures. After twelve long years of learning, the decided to return home and asked their teacher for his permission to leave the monastery. They thus, started a journey back to their hometown. 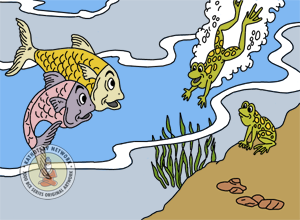 A lake was home to two fishes named Sahasrabuddhi and Satabuddhi. They were friends with a frog named Ekabuddhi, and they would meet and gossip on the banks of the lake every day. One day, they observed some fishermen passing by. They noticed the lake was full of fishes, and discussed that they would return next morning to catch the fishes in the lake. In a village there once lived a donkey named Uddhata, who carried clothes and other burdens for his master. After nightfall, he would trespass into the nearby farms and return back at dawn. One day Uddhata met a jackal and they became friends. In a southern city, there once lived a weaver named Mandharaka. His wooden frames necessary for weaving were totally damaged, and one day when he could not use them any longer, he went into the forest in search of wood for his frames. He found a gigantic tree in the seashore of the forest, and he thought that wood from this tree would make for a strong frame. In a city in the south, there lived a Brahmin named Swabhavakripan, who was known by all for his miserliness. Every day he would beg for alms, and store the corn flour that people would give to him. He filled an earthen pot with the corn flour, and hung it to a peg above his bed so that he could keep a watch on it. There was once a small state ruled by a king named Chandra, whose children were fond of playing with monkeys. The king ordered a number of monkeys to be kept in the palace and asked his servants to treat them royally. The leader of the monkeys was well versed with works of Sukracharya, Brihaspati and Chanakya, and also trained the younger ones in statecraft. Pearl was the daughter of a king named Fine-Army, who was blessed with thirty-two marks of perfect beauty. The city of Honey-Town in the north India was ruled by a king named Honey-Host. A daughter was born to him with three breasts. As soon as he learned about the unfortunate birth, he summoned the chamberlain and said, "Take the girl to the forest, so that nobody learns of this fact." One day a fiend name Cruel met a Brahmin in his wanderings in the forest, and climbed on his shoulder, and said, "Keep going ahead." 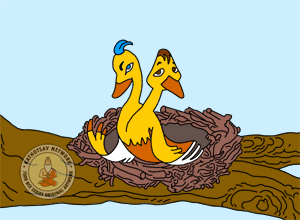 There was a great bird named Bharunda which lived on the banks of a lake. He was special for he had two heads but a single body. One day, he found a delicious fruit. One of the heads said, "My good luck to have found this delicious fruit, I am sure it is sent from the heaven only for me". In a village, there lived a Brahmin boy named Brahmadatta. One day, he prepared to travel to another village. But his mother was against him travelling alone. The boy tried to convince his mother that the village he was going to was safe, and that she should not be afraid. 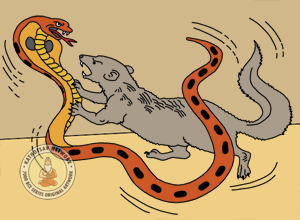 Thus ends the fifth and final part of the Panchatantra.